Last week Jennifer and I had a visitor that stayed for dinner. Our quest enjoyed the dinner very much, but there was one thing she had a remark about: The olives that I served with the dinner! According her these olives weren’t of the best quality. As she always had these shiny uniform coloured black olives. Those were the real good ones and those more greenish pale coloured I had were not. I had some bad news for her! The olives I served were brought back from Lesvos by Marissa and Richard, who spent their vacation there. The thing is those deep dark shiny olives don’t exist, not by nature anyway. Maybe lets first see what the difference is between green and black olives. The colour shows how ripe the olives were when they were picked. Green olives are picked before riping and black olives when they are ripe, which is when the colour turns black. Lets right away make a point here: Ripe olives are not black, they are more dark purple and are not uniform in colour (how much depends on the species). So these ripe “black” olives are not the deep black uniform coloured olives you can buy in the supermarket. 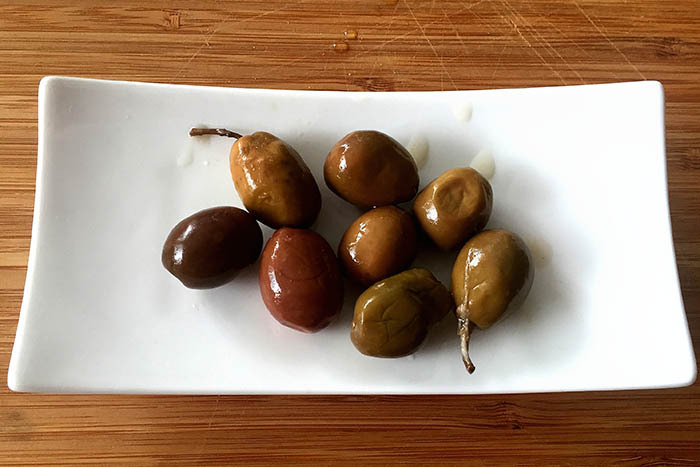 The shiny black olives from the supermarket are really green olives that are treated during the curing with calcium chloride salts, iron salts (ferrous gluconate). This gives them the dark shiny colour and they are this way faster edible. There are some health concerns about calcium chloride salts and ferrous gluconate going around, but I don’t know how serious these have to be taken. But a fact is that olives treated with this salts lose in taste. This special strong taste the olives normally have is lost and that is a big pity. So taste was sacrificed here for how the olives look. Of course the big Olive Companies in California will try to convince you other wise. But those who have tasted the “real natural” olives from Greece or Italy know better! And oh, since our visit to Lesvos the Kolovi olive is my favourite, closely followed by the Kalamata. For your trivia: Olives are fruits. Yes, they are . 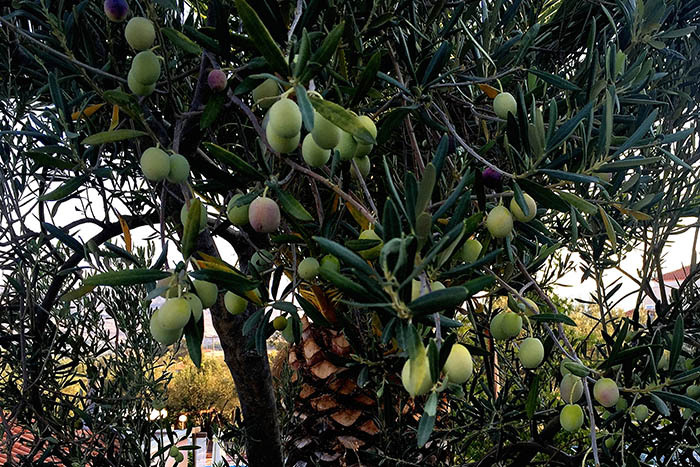 Very nice article and I agree, the olives from Lesvos are wonderful. I will bring you some more olives when I return from my holiday there :-). I always thought that this was common knowledge, but over again it seems not.